EDITOR'S NOTE: This story is no longer being updated. Go here for the latest. Federal, D.C., Maryland and Virginia government offices will be closed Monday as officials encourage residents to stay off the roads and allow the blizzard cleanup effort to continue. The Office of Personnel Management announced federal offices in the D.C. area will be closed Monday, but emergency and telework employees required to work must follow their agency's policies. 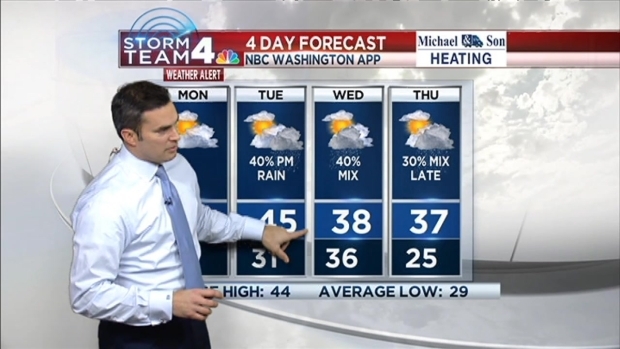 Storm Team4 Chief Meteorologist Doug Kammerer has the forecast for Jan. 24, 2015. “We want to have tomorrow to continue to keep cars off the road so that we can clear those major arterials and also clear the places where many people who come to our downtown would normally park,” D.C. Mayor Muriel Bowser said. This storm will easily rank among the region's five worst, and the cleanup is likely to take days, Storm Team4 said. Temperatures across the area plummeted overnight, creating icy conditions on many of the region's roads. McAuliffe said the costs of cleaning up the snowstorm would run $2-$3 million per hour, easily making it the most expensive snow event in the state's history. "Please stay of the roads," the governor said. "Give us the time to do what we need to do." 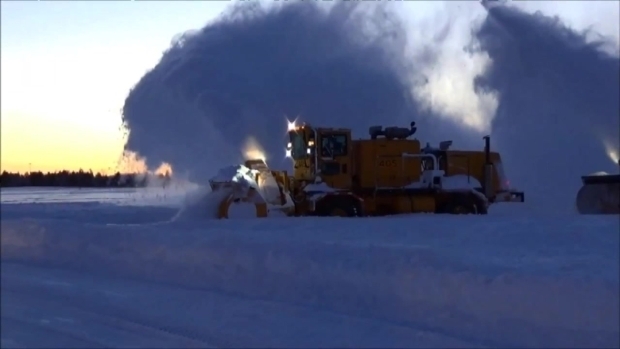 After getting more than 29 inches of snow at Dulles, it takes a massive effort to move it out. Bowser also announced public schools in the District of Columbia will be closed on Monday. The school system is responsible for almost 49,000 students. Governments are doing what they can to help. Hogan closed interstates 270 and 70 on Saturday so that plows could clear the roads. They reopened shortly after 7 a.m. Sunday, but officials urge drivers to stay off the roads, if possible. Hogan said at a news conference late Sunday morning that even though the storm has passed and the sun is shining, roads remain "extremely treacherous." He says all mass and public transit remain offline and said he would decide later Sunday whether state employees will need to report to their jobs on Monday. Hogan says Maryland has fared well so far, with no traffic fatalities in the storm and fewer than 300 customers still without electricity from a high of 10,000 during the height of the storm. Vehicles parked or abandoned on any snow emergency route, or considered to be road hazards, will be removed at the owner's expense. Cars that are in the lane of traffic on any road, and deemed a hazard or a barrier to snow removal, may also be towed. Metro extended free overnight parking at its garages until Tuesday. Parking gates will remain open through 9:30 a.m. Tuesday, and parking fees will go back in effect after that. Emergency personnel are reassured that there were relatively few power outages. 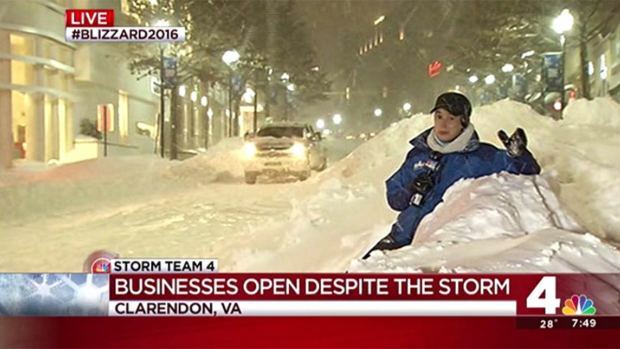 As of early Monday, there were no major outages in northern Virginia, Maryland and D.C. But the storm wrought other damage. It's possible that heavy snow led to the collapse of a roof at an apartment building in Manassas, Virginia. The storm is gone, but weather conditions can and will create some freezing. In Virginia, state police received calls for 1,374 crashes and 1,883 disabled vehicles between midnight Friday and 10 p.m. Saturday across the commonwealth. Three people with ties to the area died shoveling snow. A Fort Washington, Maryland, resident died Saturday, Prince George's County fire department spokesman Mark Brady said. The death happened moments after the department published a warning about the dangers ofshoveling snow on Twitter. An 82-year-old man died of an apparent heart attack in D.C. Sunday, police said. And a U.S. Capitol Police officer suffered a heart attack at his home in Delaware Saturday. In Stafford County, a baby boy was born at home. 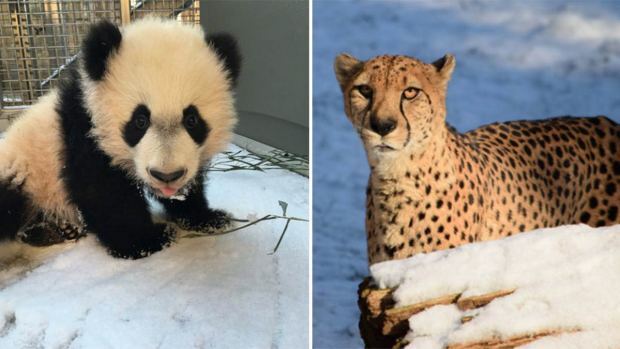 A 911 dispatcher talked the father-to-be through the delivery over the phone after the family's' midwife wasn't able to get to their home through the snow. The blizzard closed runways at Reagan National Airport and Dulles International Airport through Sunday, but one runway at each airport is expected to open Monday. The entire Metro system was closed for the weekend, with Metrorail service ending at 11 p.m. Friday. Metrobus service shut down at 5 p.m. Friday, and MetroAccess service ended at 6 p.m. Limited service will be restored Monday. County bus services also closed. Arlington County's ART bus service and Montgomery County's Ride On system will stay closed through the weekend. In Prince George's County, TheBus service has been suspended. D.C., Maryland and Virginia leaders all declared states of emergency, and a snow emergency is also in effect in the district, allowing transportation workers to clear snow emergency routes curb to curb. Violators face a $250 ticket, a $100 tow and a $25-per-day fee until they pick up their vehicles. 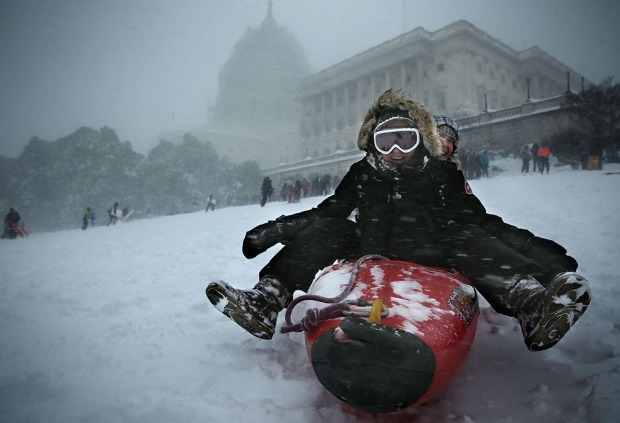 By Friday afternoon, D.C. had already issued more than 2,700 tickets and towed 187 vehicles. A state of emergency declaration authorizes state agencies to assist local governments in response to the storm. Maryland's state of emergency began at 7 a.m. Friday. The Maryland National Guard is on standby, Gov. Larry Hogan said. A snow emergency for the entire state began at noon Friday.